Bored? How about a speech-language scavenger hunt? 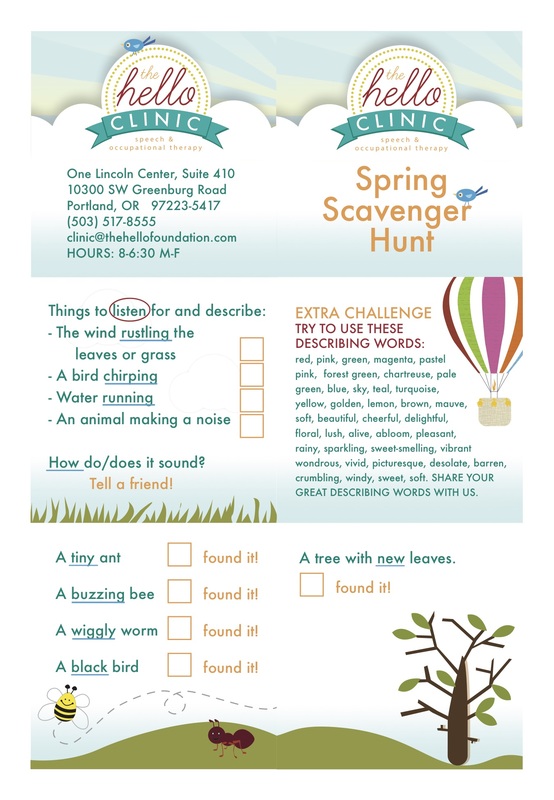 We used this fun speech-language scavenger hunt as a give away at the Autism Society of Oregon’s Autism Walk in April and thought it might be fun to share them here as well. Yes, yes, we know. Spring has given way to summer. And for those of you in other parts of the country, that might mean a drastic change in the weather. But here in Oregon? Well, sometimes we call this month Juneuary. Regardless of the season or the weather, heading outside is always a great speech-language activity! There is never any shortage of great things to talk about and look for, so if these speech and language targets don’t match up for where you are right now, improvise! To use: click on the image below and download the pdf. Print 2-sided. Cut along the lines, left-to-right, into 3 pieces. Stack the 3 pages with the title page/address page on the outside. Fold, staple, and go!